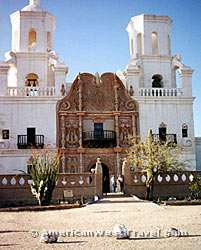 Mission San Xavier del Bac. 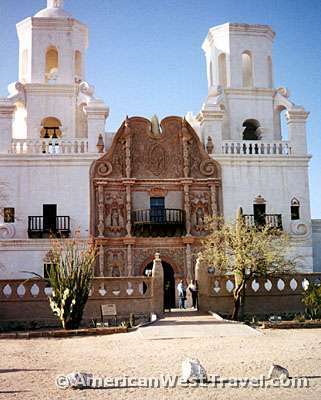 The mission was originally founded in the 17th century by the Jesuit missionary, Father Kino. The beautiful building (left) known as the "White Dove of the Desert", built from 1783-97, stands out like a beacon with its bright color. The murals and decorations inside the sanctuary have been refurbished in recent years and restored to their original beauty. Tubac Presidio State Historic Park. The original native village here was first visited by Father Kino in 1691. Originally a fort, the Tubac Presidio became Arizona's first European settlement in 1752. The site is also Arizona's first state park. Tumacácori National Historical Park. Tumacácori NHP protects three Spanish colonial mission ruins in southern Arizona: Tumacácori, Guevavi, and Calabazas. The adobe structures are on three sites, with a visitor center at Tumacácori. Franciscan missionaries began construction of the massive adobe church here around 1800. Though never completed, the site was in use until 1848 when it was abandoned. 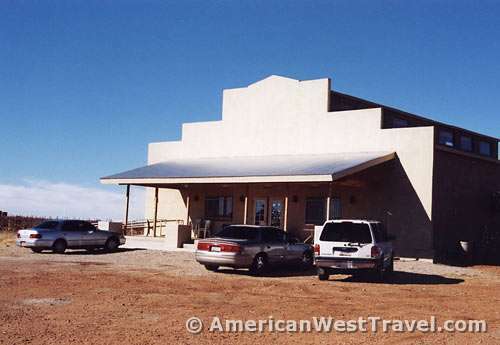 From Nogales, head northeast on the scenic Sonoita Highway (AZ-82) towards "wine country". 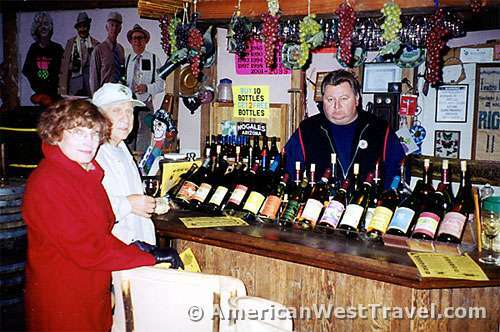 Make a stop at Arizona Vineyards just outside of Nogales. 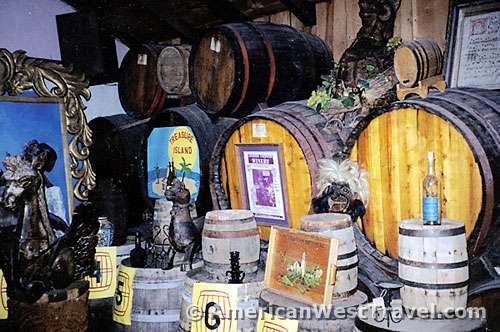 The wines here are inexpensive but the tasting room is crammed with all manner of interesting "old west" decorations and knick-knacks. After you pass through the mountains and by beautiful Patagonia Lake, the country opens into vast rangeland occasionally broken by small mountain ranges. The land here is traditionally used for ranching but it is also excellent for growing wine grapes. The 5,000 foot elevation creates summer growing seasons with hot days and cool nights. A good environment for growing grapes, especially those which produce very bold red wines. When you reach the village of Sonoita, follow the signs to the even tinier village of Elgin. On the way, your first stop is tiny Callaghan Vineyards. Their modest tasting room (left), open Friday through Sunday, is not indicative of their superb wines. In fact, Callaghan wines are considered among the finest in the United States by such authorities as Le Monde (the French national newspaper) and the Wine Advocate. Their wines have been presented at White House state dinners on two occasions. 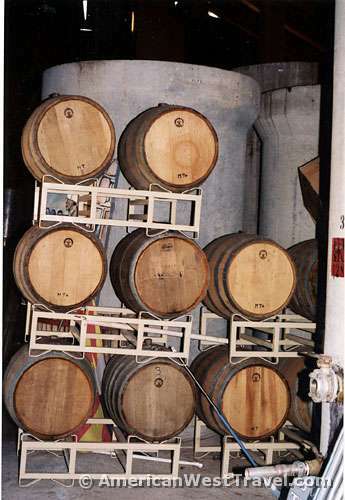 The Callaghan family maintains a vineyard of roughly 17 acres with resulting vintages in the hundreds of barrels. Their trademark offering each year is their superb Buena Suerte Cuvee, a blend of bold red wines. 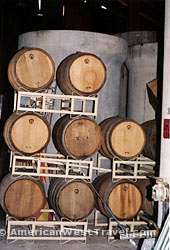 The tasting room (right) is run by Lisa Callaghan. Her husband, winemaker Kent Callaghan, is usually on hand to discuss their latest issues. Typical of Arizona, the experience here is low on formality and plenty high on hospitality. It is as memorable as the wine. Actually, you never know what's going to happen. 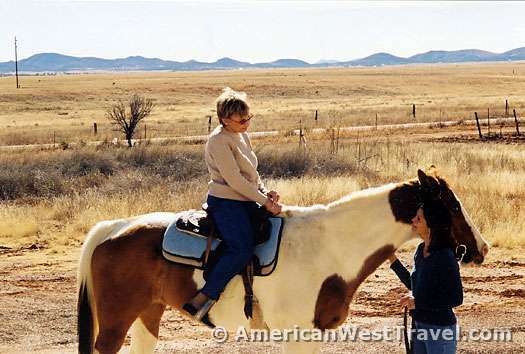 (Left), my aunt (from New York City) gets a riding lesson from a friend of the Callaghans. Kent Callaghan is one of the up and coming winemakers in the United States. You can read more about his views on wine at http://www.callaghanvineyards.com. Continue on through the quaint village of Elgin, and head a short distance south to the Sonoita Vineyards. This is Arizona's first "modern" vineyard. (The Spanish missionaries produced wine in Arizona hundreds of years ago.) Following successful experiments, Dr. Gordon Dutt planted the state's first commercial vineyard in 1979, and eventually had one of his wines served in the White House as well. 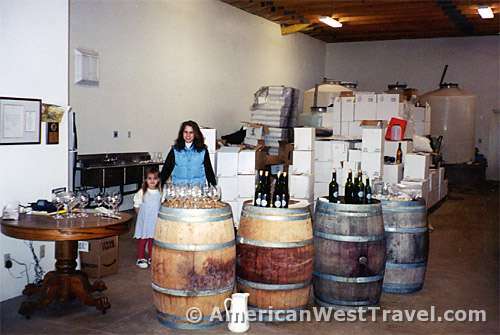 The winery offers a variety of inexpensive and premium wines for tasting. Again, the best premium wines are bold reds, typical of this area. They often make some of their library wines (very old vintages) available at reasonable prices. Their latest variety is the Mission, the grape of choice of the early Spanish missionaries, and dating to the 16th century. You may return to Tucson by returning to the Sonoita Highway and continuing north through a very scenic stretch up to I-10, then west on the freeway. 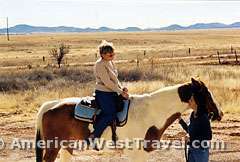 There are a number of very fine inns and BB's available in and around Sonoita and Elgin. We generally return to a motel in Tucson so that we may dine at the fabulous Cafe Poca Cosa, in the basement of the downtown Clarion Hotel (Editor's Note: The restaurant has since moved to its new location at 110 E. Pennington in downtown Tucson). The best word to describe the restaurant (above) and the food is "Festive!". It features the unique creations of owner and chef, Susana Davila. Mexican food, but no tacos or fajitas. The menu changes every day so there are different dishes to try whenever we come here. Ms. Davila has received numerous honors and has appeared on several of the "greatest chefs" shows on the various food channels. She also always comes to your table to make sure you're satisfied. Check out this professional review from the Tucson Weekly. From Tucson, Arizona, go south on Interstate-19 to Nogales, northeast on Arizona-82 to Sonoita. Follow signs to Elgin and wineries. Return to Arizona-82, go north to Interstate-10, then west for return to Tucson.